Trying to Decide If You Should Look into Bay Area Moving Companies? As much as you might be looking forward to living in your new home, most people don’t look forward to the moving process. Perhaps you are wondering if you should attempt to do all the work yourself or hire Bay Area movers to help. Both options have pros and cons, which we explore below. Packing up everything you own and moving it to a new location is a huge undertaking. People sometimes start out thinking they can manage everything on their own to save money but soon realize that getting help from Bay Area moving companies is a better solution. Your time is valuable, and you need to consider the cost savings of moving on your own against how much time it will take you to complete the process. Keep in mind that moving often takes a lot longer than people expect it to take. You will incur at least some expenses when taking the do-it-yourself route with moving. Unless you plan to make several trips in your own vehicle, you will need to rent a moving truck or van to get everything to your new location. You can always ask friends and family to pitch in if this cost is too much. However, you will need to work around everyone’s schedule and you also need to consider that it’s hard physical work that not everyone has the stamina to perform the duties it requires. The biggest advantage to hiring Bay Area movers is that you can request as few or as many services as you would like. For example, you may want the movers to pack items at your current home and then transport and unload them at your new home. Maybe you can handle the packing and unloading but just need help getting your items from Point A to Point B. Bay Area moving companies will provide you with an accurate quote to cover just the services you need. Another big benefit to consider is that Bay Area moving and storage companies insure your belongings. This should make it easier for you to trust someone else with your most valuable possessions. 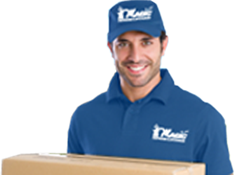 With a professional moving company, you can complete the process of moving in hours not days. If you have just decided to move, collecting quotes now will help you compare Bay Area moving companies and reserve the dates you need as early as possible. Have You Decided to Hire a Bay Area Moving Company? There are a lot of choices out there. Get a free quote on moving and storage services today from Magic Moving. Click HERE for a quote. October 26, 2018 , Posted in Moving in the Bay Area, Residential Moving Recognition by movingadmin.